What are MBOX files – MBOX files are mailbox format supported by lots of email clients like PocoMail, Thunderbird, Spice Bird, Postbox, Eudora, Mac Mail and many more. There are so many users who want to migrate from these email applications to Zimbra Desktop format. And Zimbra Desktop saves its data into .tgz format, users can import and export only tgz files from Zimbra Desktop. But the question is how to convert MBOX File to TGZ format without losing emails formatting and details. So to import MBOX File data to Zimbra TGZ file format, it will be good to use external email conversion tool to convert MBOX to TGZ with an easy manner and MBOX to Zimbra Migration Tool is the right choice to convert multiple MBOX files to TGZ format without any data loss. Now I am going to tell you why I choose this MBOX to Zimbra Migration Tool to Import MBOX to Zimbra WebMail? This Software is the right choice for converting multiple MBOX files into Zimbra Webmail TGZ file format. Software has very easy and the basic graphical interface so that first time users can also easily handle the software instructions. It will perform the MBOX file conversion without missing a single detail. Keep emails RTF and other forwarding intact. You can try the Free Trial version of software which provide you a fair idea about the software working process, so first try the software get complete satisfaction then purchase key license of software. 1 - Convert multiple MBOX files – Software will provide Multiple Files conversion option to convert MBOX files in batch, save all MBOX files in one Folder, then add that folder to software during the conversion process. 2 - Convert attachments with emails – If your MBOX emails have attachments, then software converts all attachments with their respective emails. 3 - Retains all formatting of emails – Software will maintain all the formatting of emails, emails header, body source, subject, font, images, color, text, etc. 4 - Supports all MBOX files supported application – software will support all the applications which support MBOX files, for example Thunderbird, Eudora, Mac Mail, Pocomail, Entourage, Spicebird, Mailbird. Use Software Demo version and try it by yourself, use its features, then decide to pay for license version. 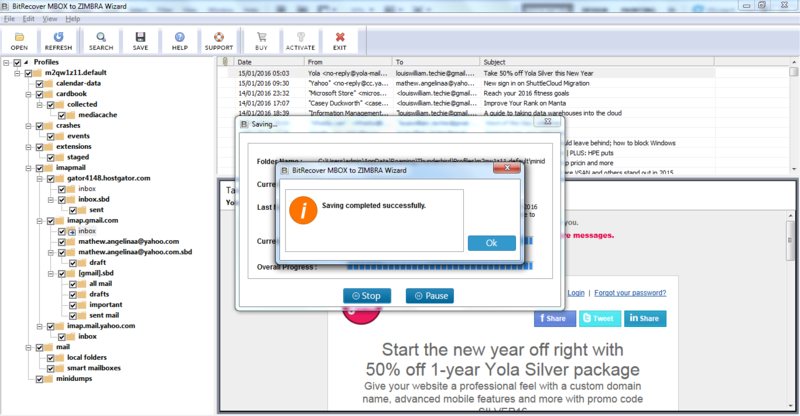 After MBOX to Zimbra Migration users can easily import converted tgz file in Zimbra Desktop.